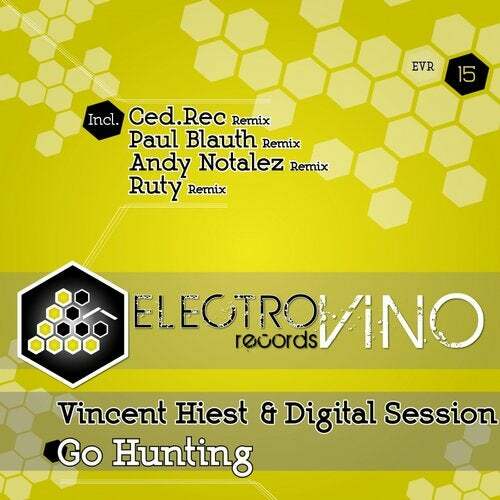 It is Vincent Hiest & Digital Session's turn to be highlighted for Electrovino Records number 015. Used to working hand in hand, the French duo take us to a techno style with their collaborative track called: Go hunting. This piece has a blend of style, we particularly love the heavy atmosphere, the efficiency of the bass line and the big breakdown. A simple program: blowing your mind. The Swedish Andy Notalez, head of the famous Yellow Recordings label, is also involved in the project and gives us a remix of Go hunting in the vein of his other compositions. His version has all the ingredients to rock the dancefloor. In the same manner, Paul Blauth gives us his vision of the track from Vincent Hiest & Digital Session and is consistent with his other productions: it is techno, techno, techno. The French artist Ced.Rec, has once again collaborated with us and offers up a stronger remix, so beware! To close EVR 015, the third pillar of Electrovino Records, Ruty could not miss the opportunity to work on the project and revisit the original in his way. This full release should be played loud!